KitMonsters – Teenage Engineering OP-1. The music makers’ guide to making music. The OP-1 packs an amazing array of features into a small synth/sequencer/sampler/controller that can run off batteries for hours and even has a 4-track tape function. It has 8 built-in synth engines and a drag and drop feature that means you can plug it in to a Mac or PC with no extra software. 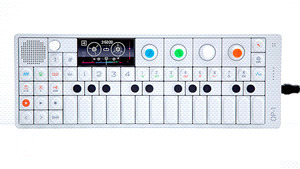 Leading Electronic artists using the OP-1 include Diplo, Tiesto, Deadmau5, Gaslampkiller and Matt Black from Coldcut, as well as artists such as Franz Ferdinand, Beck and Linkin Park.